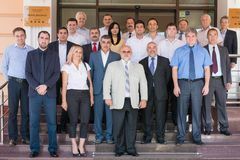 The European Union (EU) funded TRACECA Maritime Safety and Security II Project within its activities 4.2-4.3 organised a Seminar on the prevention of marine pollution by oil and other substances (MARPOL Convention). This Seminar took place in Chisinau, Moldova, from Tuesday 21 July to Thursday 23 July 2015. - foster exchange of experiences in the region. The Seminar was aimed at officials of the project's direct beneficiary countries involved in maritime affairs and protection of the marine environment.